Would you like to add a laminated scoring table to your order so that you score your games of Chicago bridge correctly? 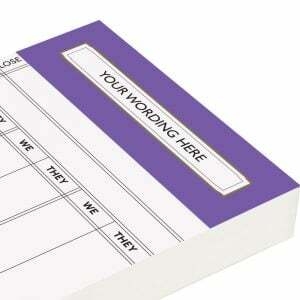 We offer two sizes: Pocket (business card) size and Large (A5) size. These Chicago Bridge Score Cards are top-quality 300gsm Conqueror Brilliant White Wove card comes with a blank area at the top that you can write details about your current game or match in to. The Chicago Bridge score card beneath is designed to give you maximum space for scoring.